Until eight weeks ago, I had no idea what a liger was, until I read an article about this beautiful hybrid big cat that only thrives in captivity. According to A-Z Animals, a liger is the offspring of a male lion (Panther leo) and female tiger or tigress (Panther tigris), which is striped and can come in different colors like tan with black stripes. Additionally, the hybrid liger can also come out white with black stripes; however, the color depends on the color of the parents. So far, ligers have not been found in the wild, because lions and tigers actually live in different areas of the world. According to A-Z Animals, these hybrid ligers are generally sterile and only a small number of these beautiful big cats can be found in different zoos. These hybrid big cats measure about 12ft. tall whenever they are standing on their hind legs. 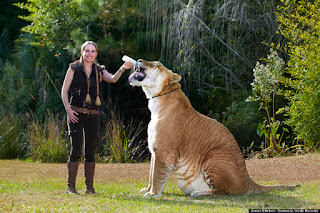 These amazing hybrid big cats are huge compared to it parents and generally is known is the world’s largest cat. One liger named, Hercules carries the world record in the 2014 Guinness Book of World Records for being biggest living liger in the world. According to Huff Post, Hercules weighs 922lbs and 131 inches long, as well as 49 inches tall at the shoulders. He enjoys his home at the Myrtle Beach Safari Wildlife Preserve in South Carolina. 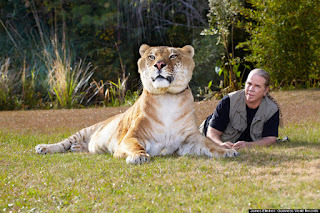 As a liger, Hercules is an endangered species due to the small number of these hybrid cats in the world.